It has been approximately 10 years since I've last visited Klang Parade, and to be honest, I had no idea that they've revamped the place. After being invited to participate in several activities revolving in Klang Parade, that was the time I found out that it has re-opened. In short, Klang Parade was under renovation since May last year and was recently re-open early this year. From an aesthetical point of view, it looks a hell lot better compared to what I remembered 10 years ago. To be honest, the Klang Parade I know 10 years ago was pretty bad. The whole building was dim, dull and lacking that vibrant crowd. Not to mention, narrow walkways and horrible, toilets to say the least. Not forgetting the tight and dark parking as well. Finally, after so many years, they've decided to revamp the entire building which I find is the right thing to do. Now, it looks bright, clean, and rather 'happening'. The walkways/corridors are so much wider now along with a variety of shops and restaurant. And here is a brief summary of what we did and explored on that day. Yes, for some reason I purposely took the paper-plastic sign with the number 7. 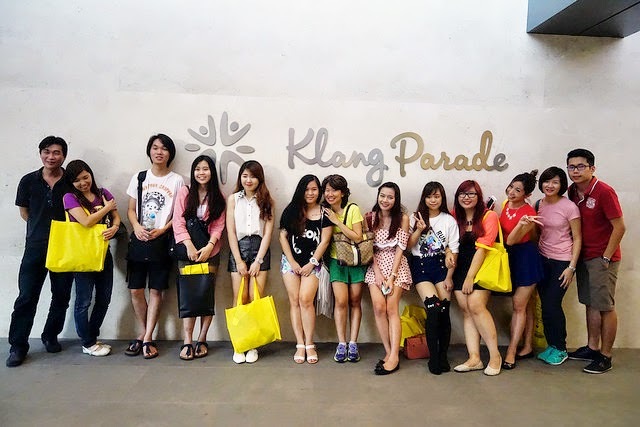 We started off with a tour around Klang Parade after a short briefing from the organiser, Christina. One of the first thing we passed by and stopped for a photo was here, Kidz Paradise. For some reason, they have man-made sand-rice thingy in there for the kids to play. Watching in envy, I wondered why don't they have this years ago when I was that little. Seems fairly fun enough to play. Of course, the old Parkson with its yearly Parkson Grand sale is also here. Vintage Library - where everything seems rather hipster-ish. Plenty of fun decor items and relatively-useful bags and pouches. igentis restaurant - serving local delicacies. One of the popular restaurants in Klang Parade. They were pretty full even on my second revisit to Klang Parade. Teppanyaki - I believe almost everyone would recognize this restaurant from a far. Cooking and serving meat and vegetables right in front of you. The tour continues for quite some time, and occasionally stopping by at beauty shops which I'm too embarrassed to take photo off. In terms of activities and games, the NEXT Hip Hop Arena was our first stop. It was an extremely weird experience for me as I had to compete in a dress-up competition with 8 other girls, with me being the only guy. Also, unfortunately I had to dress up like Justin Timberlake. On the far left, I look like an odd one out. The next challenge was held in this restaurant - Don Kaiten. Obviously, as you can already know, it was an eating competition. And to state the obvious from a Japanese restaurant, wasabi filled sushi was the challenge. Obviously, I could not lose this challenge. As I was a challenger, I was not able to take a photo of myself stuffing sushi down my throat. The final challenge was held in Econsave, and possibly also the hardest one. We were given a limit of RM100 and was required to find a selection of items on the list. The idea is to obtain all of the core items, and selecting your own purchase with the balance. The core would cost around RM85++, so there would be a balance of RM15 we had to filled out. Unfortunately, I was unable to obtain 1 item out of the core which immediately disqualifies me. So sad. First prize winner got a RM200 Econsave voucher. Damn it. All and all, it was a rather unique and fun experience organised by the Orchan Team. A great thanks to Christina for inviting and her team for planning out our activities. It was genuinely my first time attending this form of event ahaha.